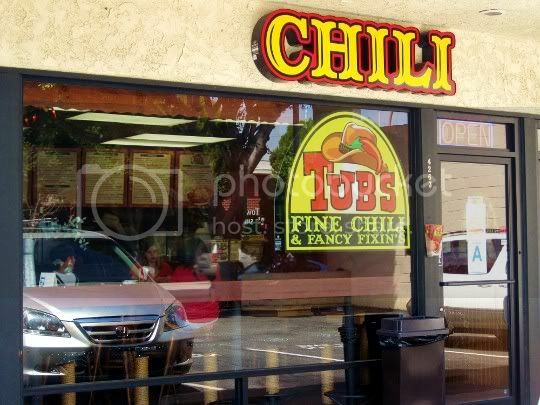 Hidden in a tiny Culver City strip mall lies Tub's Fine Chili & Fancy Fixin's, a small western-themed restaurant serving up multiple chili varieties, chili-based creations, and perfect complementary sides. 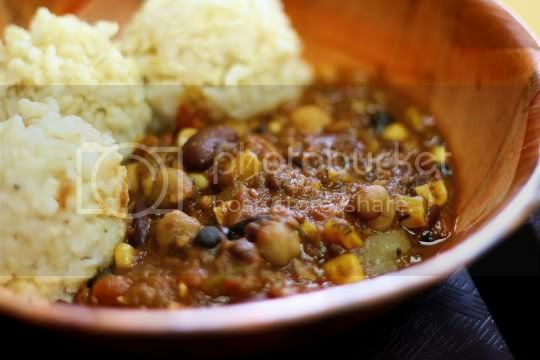 It's seemingly a very "man's man," no-frills, and no-healthy-eaters-allowed kind of place...so imagine my surprise to find out they actually have a vegan chili, with some astounding vegetarian chili creations! If you're into the whole wild West thing, then you'll love the decor. The small interior combines rich maroon-colored walls and wood paneling, rope-wrapped barstools and tables, and festive red chili string lights. For entertainment purposes, there's a big flat-screen TV showing (of course) old black-and-white westerns, while (what else) country music plays through the restaurant. And yes, there are even saddle-shaped stools. 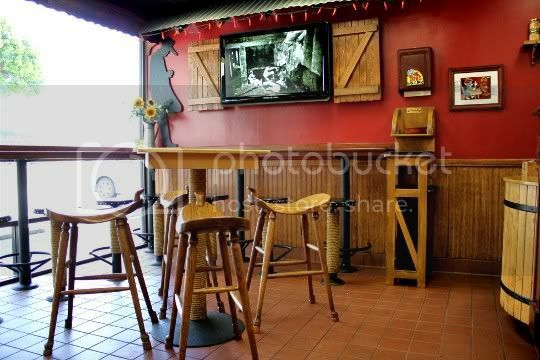 Tub's is such a neighborhood, family-friendly environment, and it seems as if most of the diners are regulars. The friendly, cowboy-hat-donning, twang-voiced owner adds to Tubs' down-home feel, and he's ready to go into detail about each and every menu item, specifically what's available for vegetarian or vegan diners. The rest of the staff is out-of-their-way friendly, but not in an annoying way: the service here reminds me of going to a relative's home, where they do all they can to make you feel comfortable and satisfied. I'll start with the chili, which is your veggie base for all of Tubs' creations. In one word? Amazing. In fact, I don't even have one negative thing to say or suggestion to make. I can't believe how homemade this tastes: the ingredients are fresh, the spices are abundant, and the flavors are overwhelming (but in a good, delicious way). And there's some of everything in here: kidney beans, soy crumbles, tomatoes, chickpeas, black beans, corn, onions, and bell peppers. It's slightly sweet, tangy, and has a surprising amount of heat that sneaks up on you. You have the option of eating this in a bread bowl or with brown rice or corkscrew pasta (and that's just the beginning of the possibilities). The smallest 6-ounce serving is perfect for one meal; go larger for only 60 cents each additional ounce (what a deal!). 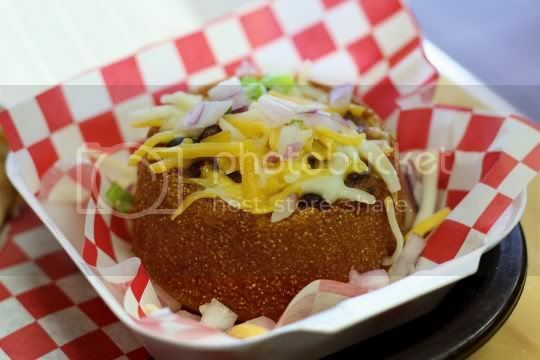 For a perfect appetizer, take the aforementioned chili and stuff it into a hollowed-out, deep-fried cornbread muffin, then top it with cheese and onions. Delicious! The cornbread is sweet and crunchy, and surprisingly not very greasy. One of these is the perfect intro to the multitude of chili creations here, but I could definitely get two or three and call it a meal. 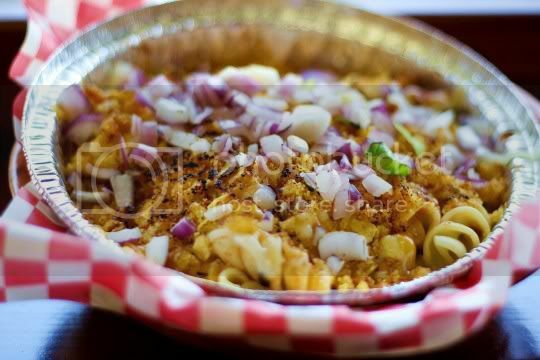 An interesting take on the infamous Cincinnati chili, this dish is chili mixed with corkscrew pasta, then topped with cheese, red onions, green onions, and crunchy corn chips. The icing on the cake, however, is sweet cornbread crumbs sprinkled on top and toasted. I think the toasting is done with a butane torch, as you can unfortunately taste a little of the lighter fluid. But ah well, it's still a great dish. It's hearty and super satisfying, and you can easily get two to three meals out of it. 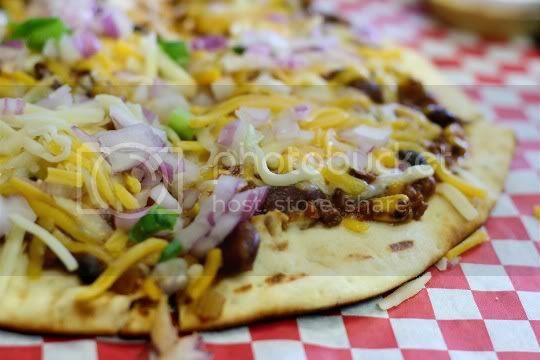 Chili on pizza? Yup, and it soooo totally works here. The flatbread pizza "crust" is crispy, chewy, and tender, and amazingly it doesn't get soggy when topped with chili (even as leftovers!). The usual toppings of cheese and red and green onions are in abundance here, and it makes this thing really loaded with toppings. The flatbread, cut into four nicely sized wedges, is sturdy enough to hold up to all of it. Dare I say, this might even be better than regular pizza? You can probably eat the whole thing in one sitting if you're really hungry, but half of it makes a nice satisfying meal. Dip each bite into some of the Mohave Mash Mustard for a truly good experience. What meal of chili would be complete without a side of potatoes, but these aren't your ordinary potatoes. Thinly sliced (skins on, of course) pieces are fried and liberally seasoned with chipotle salt, which is surprisingly spicy. 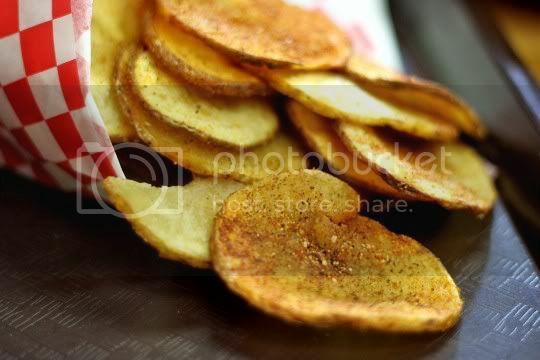 The edges are crispy, and the centers are chewy...kinda like a cross between potato chips and fries. These come served with your choice of ranch dressing or BBQ sauce; go with the latter, which is sweet, tangy, and super addictive! Oh, and don't forget the Mohave Mash. It's nice knowing a place like this exists (and only a few miles away from my home, no less): good food, great value, and stellar service! And seriously, I have zero complaints, which is rare for me! Anytime I'm hankering for some chili, I definitely know where to go. Just had lunch there. My son asked, "Is that guy a REAL cowboy?" Amazing place to eat; deserves all the attention it can get. They do have some fine selection of vegan dishes. The chili pizza has the right spicy taste to it.